The newest trend in household maintenance and body balance is an old-time item used for centuries around the house: apple cider vinegar. From cooking to cleaning to health benefits, apple cider vinegar is a household must-have. Here’s a list of all of the available benefits apple cider vinegar has to offer. It’s surprisingly easy to make this beneficial blend right in your own house. 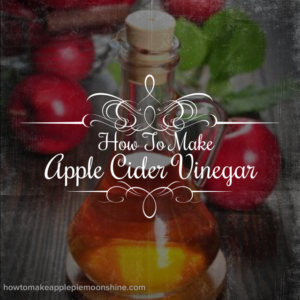 This recipe will walk you through the best way to produce the best at-home apple cider vinegar for a variety of purposes. This project is great to start after you have used apples in an another project, like making a pie or some homemade apple sauce. Make just about anything that calls for peeled and cored apples. The apple scraps are what we need. Add the scraps to a large bowl or jug. Place cheese cloth over the top of the bowl or jug. This cloth keeps the apple cider vinegar away from the metal, preventing it from picking up any metallic flavors as well preventing erosion of the metal lid. The cheese cloth also allows the fermentation to breathe a bit as well as make sure that pesky fruit flies stay out. Seal tightly by placing either a plate or flat surface on top and then something weighted. Store in a dark, warm storage area. If mold has formed on the top layer, that is just a likely part of the process. Spoon away mold carefully to remove. Once the liquid in the bowl has turned a dark-golden color, which typically takes about 2 weeks, proceed to strain with cheese cloth to separate apples and sediment from vinegar. Put remaining liquid into a canning jar, place cheese cloth on top of the jar, then place the lid on top. Seal as tightly as possible. Set your jar aside for at least 6 weeks. Once 6 to 8 weeks has passed, open and use as desired. I can image what you are thinking, “There must be more to it.” But truly, it’s that simple.